San Diego’s incredible weather is no secret – the city’s residents spend 90% of the year outside and in the beautiful, fresh air. From hiking, to biking, to surfing, to running, San Diego is an outdoorsy person’s paradise. Sometimes though, I feel like getting out of the house while still having a relaxing day. 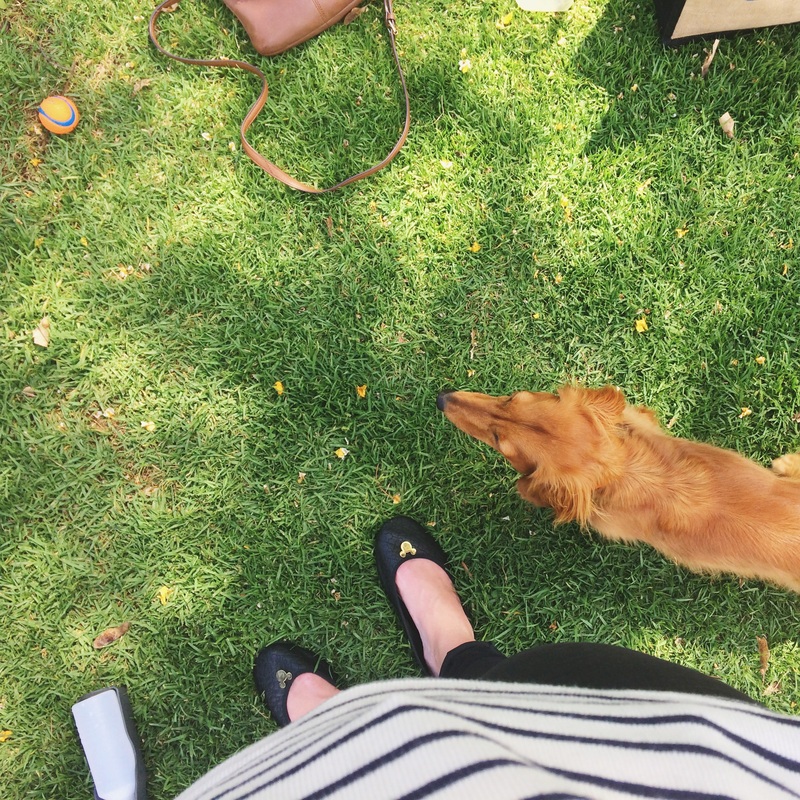 These days call for a park visit! San Diego has countless parks, the most popular being Balboa Park (don’t worry, I’ll do an entire post about that later on.) Even Balboa Park is a little much on those days where you just want to kick back and watch the clouds roll by. When you’re looking for a nice, quiet, not-too-crowded place to chill out, I recommend Kate O. Sessions Park. 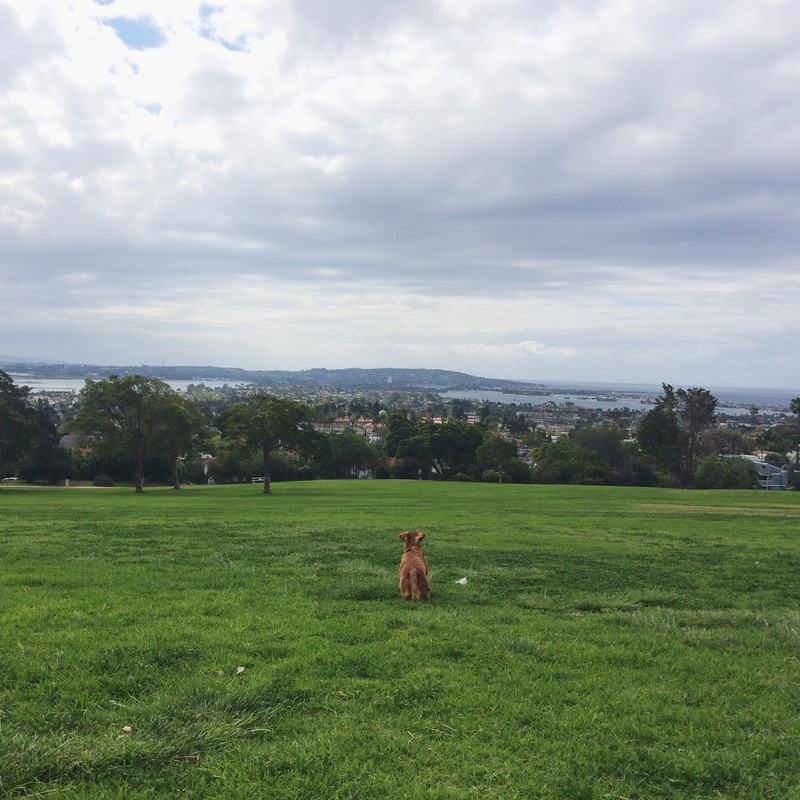 More commonly referred to as “Kate Sessions” park (because apparently people are too busy enjoying the sunshine to say that extra “O”), this beautiful area is situated on a sloping grassy hill in Pacific Beach, overlooking Mission Bay. When you drive up the hill toward the park, you’ll see there are many different sections to choose from. The stretch of grass on the left is usually filled with children’s birthday parties or summer camp events (I event thought I saw some LARPers there once!) I don’t think it’s mandated, but most of the activity-based traffic seems to gravitate toward that area. If you keep driving a few feet, you’ll find the main part of the park on the right. You can park your car anywhere in the lot for free and find yourself at the crest of the gorgeous large green grass hill that is Kate Sessions Park. There are huge trees for shade, or open areas if you prefer to soak up some rays. I have never seen it crowded to the point where I felt uncomfortable. You’ll most certainly be able to find a spot to set up a blanket, maybe even a little picnic, and lay down for a nice rest in the open air. 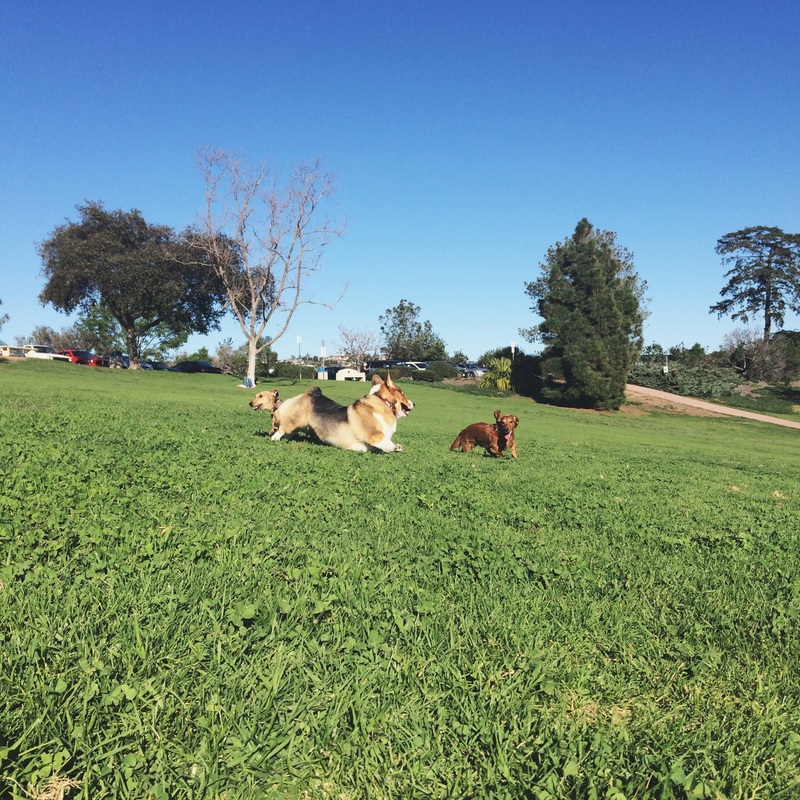 The main reason I personally visit this park is to bring my dog Jack for some play time! He absolutely adores this place. 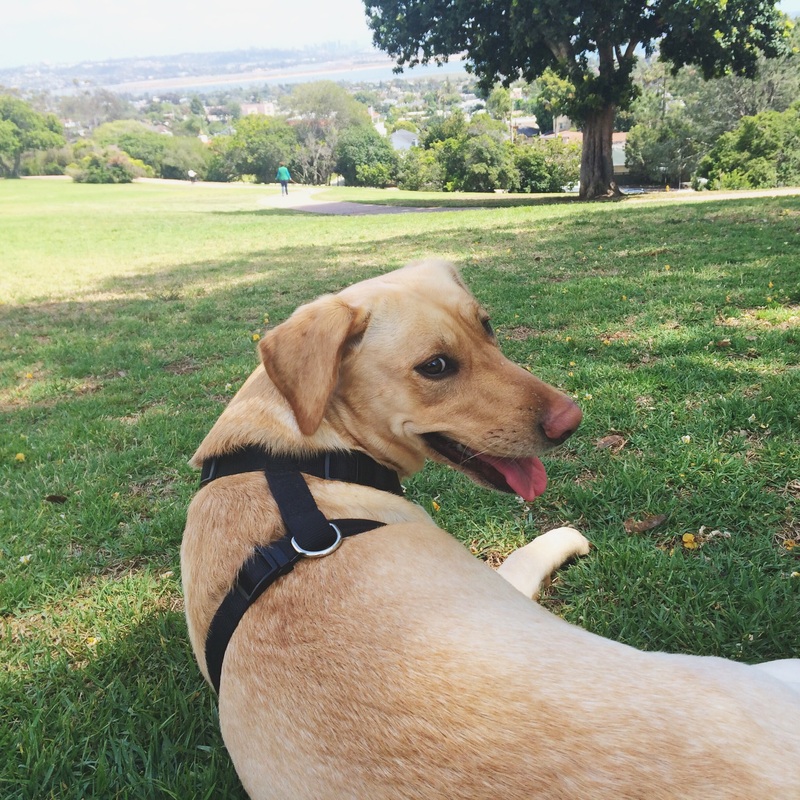 It’s not gated, but if your dog is good about staying close and listening to commands, it’s a great park for dogs. There are often 2 or 3 other dogs close by with their owners and Jack usually runs around with them for a while. It’s adorable. We bring the ball launching stick and my boyfriend flings Jack’s orange rubber ball 100 feet across the grassy field and he goes darting after it again and again before passing out from happy exhaustion. Other notes – the bathrooms are relatively clean for park bathrooms! They’re still the typical creepy cinderblock cells with no lighting, but I’ve found the seats to be impressively clean. Additionally, this park is very quiet and a little bit tucked away up the hill – I’ve never been anything but comfortable here. Great for families, laid back dates, solo picnics with a good book, you name it. What are some other parks you love in San Diego? Let me know in the comments! I LOVE Kate O. Sessions Park, and don’t go as often as I would like to.. My kiddos & I love to find new parks to explore, and are always on the lookout for unique/fun ones! We frequent Lindo Lake Park (http://www.sandiegocounty.gov/parks/picnic/lindolake.html). Although it is in what some would refer to as a “shady area”, it is one of my FAVORITE parks in San Diego. It has a lot of options to offer people of all ages and lifestyles. There are sports fields, tennis courts, horseshoe pits, walking/running trails, outdoor exercise equipment, a fairly new skate park, a community center that offers a variety of classes, two different play structure areas, tons of picnic tables, and fishing (they do events for kids where they fill the lake with bunches of fish). We’ve seen plenty of Birthday parties, weddings, and other community events there & recently picked up some of the wildlife and birdwatching pamphlets to add a new element to our visits. Most of the time when we meet up with people there (who have lived in SD their whole life), they tell me they never knew it existed. They follow that up with a statement about how awesome it is and what their favorite feature is. ← What is Potato Chip Rock?